Companies’ offices, especially sustainable offices are a real inspiration source for everyone in terms of interior design or architecture as they are trully amazing and we are delighted to discover such impressive projects and to share with you on DesignLike. This time it’s about San Pablo Group Corporate Offices located on Insurgentes Avenue in Mexico City, Mexico, which drew our attention by its new playful contemporary workspace full of vivid colours. Responsible for this wonderful and creative project completed in March 2011 is the interdisciplinary team of highly talented professionals from international design studio Space Architecture, who develop a new way of seeing architecture where sustainable solutions are part of all project to some degree. Relaxed, spacious and open, the interior design of the San Pablo Group Corporate Offices exudes casual, friendly atmosphere. Once the user open the elevator door, you’re pleasantly suprised by the circular-shaped reception area imagined as a generously-sized modern space, defined by two stained-glass windows in blue tones with abstract graphics of medicines, a central green wall featuring the logo of the company, all in a white background with plenty of artificial lighting. The reception area reveals also a particular interesting detail such as the exposed pipes in the ceiling which definitely give the interior a genuine industrial touch. A large corridor connects the main work areas and lets the user explore each one’s function and identity. They embrace playful decorations, natural hardwood, bright colours, each room having its own personality and uniqueness, very subtly framed by the variation of the pitch and intensity of the contemporary lighting. Open vistas, natural light and exterior views are a few other highlights characterizing the offices. 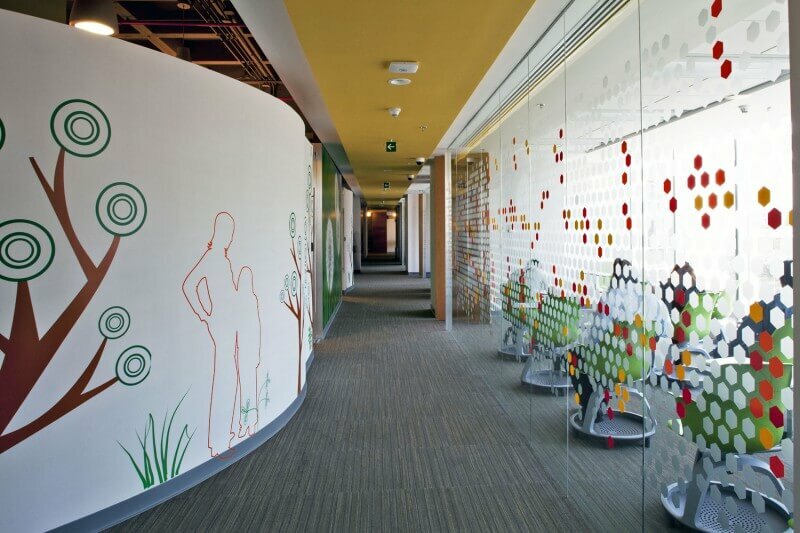 The green, the red and yellow invoke energy and passion, in order to let the employees think free and creative. As we mentioned before, these offices in Mexico of San Pablo Group besides the fact they are very modern and original, they are also sustainable offices including environmentaly friendly features. Thus, the project is registered with the USGBC and LEED GOLD certification is sought. Check it out and tell us what you think!